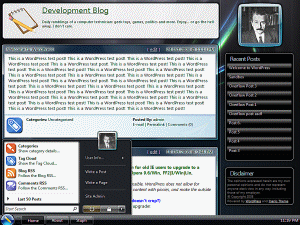 v1.3 - Glass-like theme for WP 2.6+. 2 col. fixed w/right sidebar, widget & multi-language ready, 7 reader selectable themes saved by cookie, and default sub-theme is admin selectable. Admin selectable picture. README FIRST!Created by Inanis.